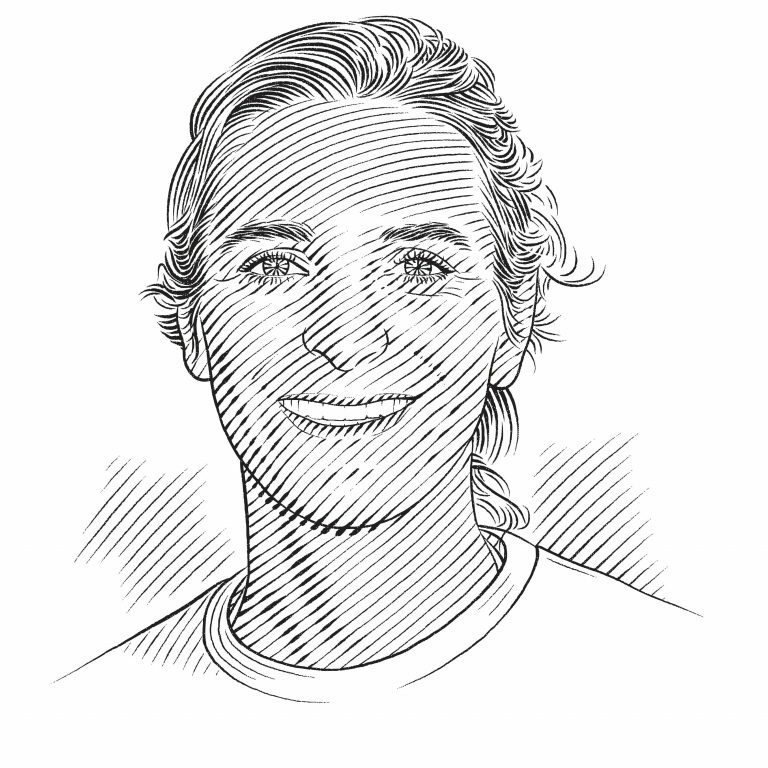 Félicie Dhellemmes is studying the behaviour of juvenile lemon sharks to understand what might be called ‘shark psychology’. Most people think of sharks as being fearless, but in reality some are bolder than others. This is true between species, as illustrated by oceanic whitetips being notorious for their curious and confident behaviour, whereas scalloped hammerheads are timid and sensitive. It is also true among individuals of the same species: divers at Tiger Beach in The Bahamas frequently comment that, of the tiger sharks encountered there, ‘Hook’ is timid whereas ‘Emma’ is more inquisitive. At the Bimini Biological Field Station, also in The Bahamas, the differences in behaviour shown by individual sharks – also called ‘personality’ – have been the subject of a long-term study. And now, more than four years on, we are no longer looking at a hypothesis. Sharks have personality, just like you and I! 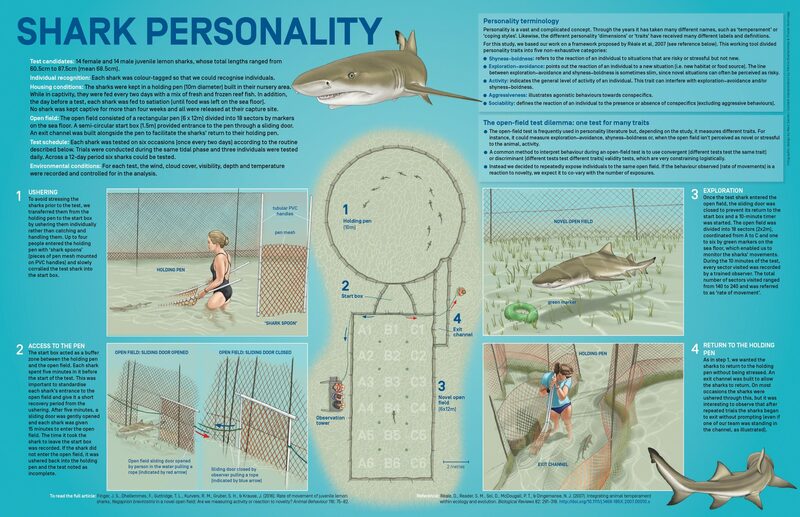 How do we measure personality in sharks? Humans we can ask to complete a simple questionnaire and then evaluate the responses, but the challenge is far more complex when large marine predators are involved. Firstly, the model species needs to be carefully selected. It must be abundant, thrive in captive conditions and be easily recaptured for multiple testing. Secondly, the scientific team must decide on tests that are relevant to the species’ behaviour in the wild. For instance, to measure individuals’ sensitivity to stress, different stimuli will have to be applied to the blacktip shark (a highly sensitive species) and the nurse shark. The nurse shark’s propensity for hiding under ledges justifies using emergence from a hide as a test, whereas exploration of an enclosure would work better for the more mobile blacktip shark. And finally, a series of pilot studies that enable us to clarify our protocol should be conducted in order to pick the test that will bring to light the animals’ personality traits most successfully. At Bimini, hundreds of juvenile lemon sharks Negaprion brevirostris can be captured and recaptured each year and maintained in semi-captive holding pens built in the shallows. For this species we found that one of the most efficient ways to perceive personality is via a novel open-field test. Put simply, the sharks are placed in a large enclosure they don’t know and their movements are monitored over a 10-minute period. They are then retested a few days later to see whether their behaviour is consistent. In general, the sharks explore the new enclosure uniformly, but some consistently explore it faster than others do, proving the presence of personality. But what are we measuring? The interpretation of personality tests adapted to animals is a recognised stumbling block for animal behaviour specialists. In our case, the rate of movement of individual sharks might vary because each one reacts differently to the stimulus provided by the new enclosure. Alternatively, the explanation could be that, in the absence of a stimulus, their baseline activity is different anyway. It is therefore important to understand how the novel open field is perceived by juvenile lemon sharks. Does this test produce enough novelty to elicit a behavioural response – and can it therefore be used as a reliable method to measure shark personality? In order to understand whether the behaviour observed was a reaction to novelty or just the sharks’ regular activity, we decided to use the concept of habituation. Habituation is a form of learning in which an animal decreases its response – or ceases to respond altogether – to a stimulus after repeated presentations. With this in mind for our trials, if the test pen provided a novel stimulus, we would expect this novelty to reduce after repeated visits. In this case, the sharks’ movements in the pen would decrease throughout the tests (with the reducing novelty); if not, they would probably remain stable. We used a subset of 28 juvenile lemon sharks (14 males and 14 females younger than two years) to explore this problem, repeating the novel open-field test on six occasions for each shark over 12 days and recording its activity. A first glance at the results revealed an overall effect of habituation. Our test, therefore, most likely reflected a reaction to novelty rather than individual differences in activity rate. But a closer look informed us that all the sharks habituated at different speeds and some even sensitised (increased their rate of movement). Surprisingly, the habituation rate of each shark (or sensitisation rate for some) correlated negatively with its personality. For example, sharks that were very active during the first test (bolder personalities) decreased their activity faster, whereas sharks that were less active in the first test (shyer personalities) actually sensitised, increasing their activity the more tests they experienced. At this point it is difficult to understand why we observed such variation in juvenile lemon shark behaviour. One can hypothesise that stress played an important role in the habituation/sensitisation process. A lemon shark less attracted to novelty might have found the situation more stressful than one that is attracted to novelty. The fact that it may have been inhibited by stress would explain a low activity score in the first test and increased activity as the tests were repeated. Excitingly, this opens the door for a new question: what are the causes and consequences of personality in sharks? Captive behavioural tests such as this enable us to prove, by means of a controlled method, that individual sharks do indeed have different personalities. They don’t, however, tell us whether – or how – these differences impact the shark’s ecology. For example, do sharks feed differently according to their personality? Or do some take greater risks than others, travelling further from shore or using larger areas to hunt in? And does this risk taking lead to faster growth rates or impact survival? The answers to such questions remain elusive for now, but given the long-term nature of our project at Bimini and the many recaptures and retesting of sharks, we envisage a bright, intriguing future for this project. And, in many years’ time, we may encounter adult lemon sharks that were tested for personality in their early life and wonder how their personality influenced their success.